Simpson Bay, St. Maarten (Sunday, October 22, 2017) – Feedback from arriving and departing passengers and other users of the temporary facilities provided by the Princess Juliana International Airport (SXM Airport) has so far been positive. SXM Airport suffered severe damages to its facilities as a result of the devastation caused by the monster storm, Irma, followed by Maria. However, on October 10, 2017, the airport welcomed its first commercial flights after the passage of the hurricanes. “We had to make temporary provisions for our departure and arrival operations,” Hyman explained. 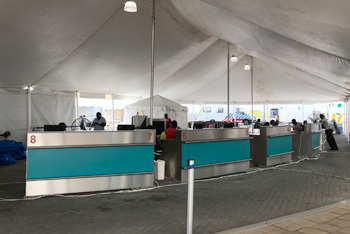 The temporary Departure hall is located at the East end of the Terminal Building and is accessible via the East gate, the same gate that was used for the processing of evacuees in the wake of the hurricanes. Upon entering the facility, passengers will go through the various processes as part of their departure experience. This includes the issuance of electronic boarding passes, the screening of carry-on and checked luggage, and outbound immigration procedures. Retail and Food and Beverage services are also available. With regards to arrival, passengers enter through the West end of the Terminal Building and clear Immigration and Customs via the building commonly known as the FBO facility. 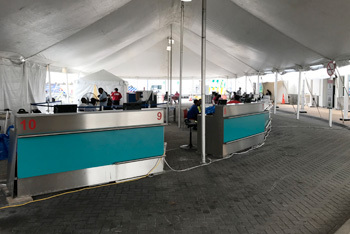 A make-shift baggage claim area has been created under big tents, where passengers can retrieve their checked luggage upon arrival. Ground transportation services are available on the landside from the Airport Taxi Association, Car Rentals and Tour Operators. “Of course, the safety and security of passengers, our employees, visitors and other users of SXM Airport remain priority number one for us, in spite of the fact that we are operating from temporary facilities,” Hyman said. “Directional signage has been in put in place along the roadsides to aid in pointing visitors and travelers to both the departure and arrival facilities,” he added. “Meanwhile, we are working very hard to ensure that repairs and rebuilding begin as soon as possible so that we can restore our airport to its pre-Irma award-winning glory. We therefore urge all users of our facilities to please bear with us as we strive to normalize our operations and make SXM Airport even stronger, better and smarter than it has ever been,” Hyman concluded.